Russian avant-garde artists will present their works in Baku. The exhibition titled "The Russian Avant-Garde Collection of the Regional Museums, 1900-1930. 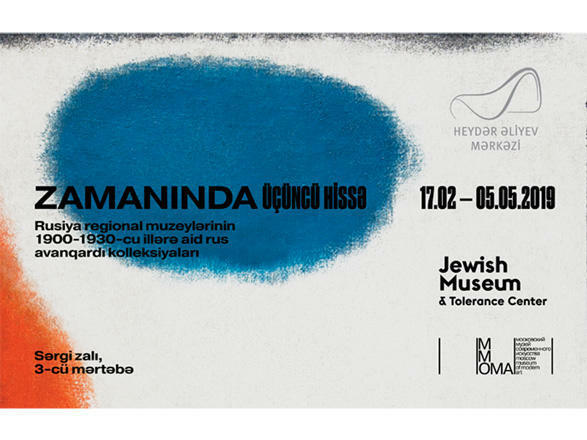 Part 3" will open at the Heydar Aliyev Center on February 17. The exposition will feature unique avant-garde paintings from 17 regional museums from all over Russia, Trend reported. The works include canvases by some recognized classical artists like Kazimir Malevich, Wassily Kandinsky, Alexander Rodchenko, Vladimir Tatlin, Alexandra Exter, Marc Chagall, as wel as Victor Bart, Alexei Grischenko, Alexei Morgunov, Sergei Romanovich, Pavel Mansurov and other figures known for their contribution to avant-garde art. More than 60 artworks will be displayed. The exhibition brings together artifacts presented previous exhibitions held in Moscow in 2016 and 2017 respectively. The time period spans from the very emergence of the Russian avant-garde art as of the mid-1900s all the way to its decline in the early 1930s. The project aims to promote works by well-known, lesser-known and unknown artists nowadays kept at various Russian regional museum collections, as well as to demonstrate the major techniques having prevailed in the Russian art throughout the first three decades of the 20th century. Supervised by Andrei Sarabyanov, an art historian and the author of a great number of works on the Russian avant-garde art, the exhibition is a joint effort of the Russian Jewish Museum and Tolerance Center, and the Modern Art Museum of Moscow. The exhibition will run until May 5.